That's about it for the penultimate week in this year's T20 Blast Group stages. Congratulations to Worcestershire Rapids who qualified for the quarter-finals. However there are still five places up for grabs. Be sure to join us next Friday as we'll have live text and radio commentaries from all the games. Saeed Ajmal's 2-21 and Richard Oliver's battling 45 helped Worcestershire secure a spot in the quarter-finals with a narrow victory over Derbyshire. Ajmal starred with the balls as the Falcons slumped to 102-6, but Alex Hughes and Tom Knight made 39 for the eighth wicket as the hosts rallied to 149-8 for their 20 overs. Oliver looked to be guiding Worcestershire to a comfortable win, before his dismissal set up a tense finale. Joe Leach got the visitors back on track with an unbeaten 18 from 12 deliveries, while Ben Cox held his nerve to hit the winning run with just three balls remaining as Worcestershire reached 150-6. It was a night to remember at Edgbaston for Steven Croft as his Lancashire side kept their noses in front in the North Group race to the quarter-finals. After losing the toss and slumping to 44-4 off just 10 overs, the man from Blackpool wrestled his team back in to the game. He struck six fours and three sixes in his unbeaten 64 as the Red Rose posted a competitive 145-6. In reply, Brendon McCullum once again looked the danger man for the Bears, but when he went for 41, the momentum turned in the visitors' favour. James Faulkner's miserly four overs brought him figures of 3-19 while Croft picked up two wickets himself and a belting catch at point to dismiss Laurie Evans. Birmingham Bears were always behind the required rate towards the close and despite Oliver Hannon-Dalby and Ateeq Javid's late efforts, they fell eight runs short. Lancashire stay fourth and just ahead of Nottinghamshire on net run-rate with one game remaining. Overseas pair Shaun Tait and Jesse Ryder combined to maintain Essex 's hopes of earning a quarter-final place as they comfortably beat struggling Middlesex. Australian Tait took 2-19 from an economical four overs as the visitors could only make 150-5, despite Nick Gubbins' early 46 from 34 balls. New Zealander Ryder then took advantage of being dropped twice, hitting eight fours and two sixes in a 39-ball innings of 59. Mitchell McClenaghan (2-33) and Harry Podmore (2-28) picked up late wickets for Middlesex as Essex stuttered, but Tom Wesley's 45 from 39 balls helped the hosts over the line. Essex visit South Group leaders Kent in their final game next Friday knowing they are likely to need to win to reach the knock-out stages. It was a night of boundaries at Hove as the two south coast neighbours clashed - but it was Hampshire who came out on top against Sussex. Hampshire posted a huge 204-3 as captain James Vince carried his bat for the third time in this year's competition with an unbeaten 90. In reply, Chris Nash and Luke Wright got Sussex off and running with a 98-run partnership and the hosts looked well set to record a huge victory. But, Nash went for 88 as Chris Wood claimed three vital wickets. Despite Craig Cachopa's big hitting to bring the chase down to 10 needed off the final over, Yasir Arafat showed all his wisdom and trickery to restrict the Sharks to just five singles as they finished on 200-6. Hampshire keep their quarter-final hopes alive while Sussex still need a point to make sure of their place in the last eight. 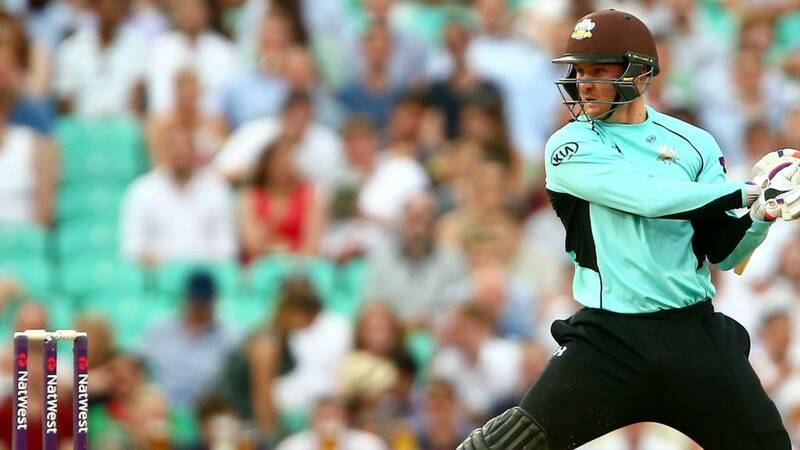 A scintillating T20 career-best 122 not out from Jason Roy propelled Surrey to a convincing victory that killed off Somerset's quarter-final hopes. The England one-day opener hammered eight fours and six sixes from 65 balls in stands of 84 with Kumar Sangakkara (31) and an unbeaten 124 with Rory Burns (46 not out). In reply to Surrey's 208-1, the visitors slumped to 18-2 and struggled from then on, limping to 170-7 at the close. Only James Hildreth (51) went on as four visiting players fell in the twenties, with Sam Curran (2-37) the pick of the Surrey attack. The hosts' own hopes of claiming a place in the last eight now depend on their final two matches at Middlesex next Thursday and at home to Sussex on Friday. Ben Duckett's composed unbeaten 40 helped Northants to a comfortable victory over an inexperienced Yorkshire side at Northampton. Yorkshire, who played a number of youngsters, struggled to 153-7 as Alex Lees top scored with 46. Richard Levi got the hosts off to a flying start in the chase, smashing 30 off 14 balls before captain Alex Wakely (46) and Duckett saw their side home. Northants sit third in the North Group but will have to win next week to guarantee qualification. Riki Wessels hit the highest ever score by a Nottinghamshire batsman in domestic T20 cricket as the Outlaws took a big stride towards the quarter finals by beating and eliminating Durham. The Jets were on top early on having limited Notts to 13-1 after three overs, but Wessels's arrival heralded a swift swing in momentum. Wessels smashed eight fours and five sixes before he was caught for 97 off the bowling of Usman Arshad, while James Taylor added a quick-fire 37 as Notts closed on 198-5. Durham's run chase never really got going, with John Hastings's 42 from 22 deliveries the only bright spot as the hosts could only muster 156-6 from their 20 overs. Glamorgan kept their hopes of a T20 Blast quarter-final spot alive with a dramatic last-ball victory at South Group leaders Kent. Chasing 180 to win, Kent needed 15 off the final over, but after scoring 12 off the first four balls, Darren Stevens fell before Calum Haggett was run out while attempting to come back for a second run and to tie the game. Kent's innings, which ended on 178-8, was largely based around Joe Denly's 70 off 36 balls. Earlier Glamorgan made 179-7 thanks to Graham Wagg's unbeaten 53 off 28 balls which included five sixes. Lancashire coach Ashley Giles: "It was a brilliant win for us and a terrific performance from the boys. We need to go and win next week. "All credit to our guys the way they stuck at it in the field. "They showed no shortage of skill either, it was a real demonstration of fight right to the end." "We knew how big a game this was and the team was desperate to put things right after we lost to Middlesex last week. "I felt there was plenty of energy from the start tonight. As it turned out with the results elsewhere it was a must win game and we've done it. It sets us up for next week against Kent. "Credit to the bowlers for the job they did as if we'd been chasing anything like 165 it would've been tough. "We're delighted with the win although we could have played better again. "We weren't quite on our A game tonight so once again to win when you don't quite play as well as you can do is a really good sign." "We played well throughout the game and improved our run rate and gave us a chance for next Friday. "Once we got 198, we knew the chance to win the game by a big margin would really help us. "I just felt that there was a big score in our team which there was and we're going to need another next week." "Words couldn't really describe my feelings. I went a bit crazy and it's something I've been working on. "It's an incredible feeling and opening up with Sanga - the wise words of that man are sensational. "I got lucky early on and every batsman needs a bit of luck but happy days, I'm super happy with the win." BBC Radio Solent's Adam Blackmore at Hove: "404 runs in 40 huge overs of cricket tonight. "One of the great group games in T20 cricket history and a privilege to watch it. "For me, Danny Briggs going at only six-an-over where most bowlers went for nine-an-over was the difference with his class of T20 bowling." Hampshire captain James Vince told BBC Radio Solent: "It turned out to be a really good wicket and it played really well, getting even better as the night went on. "To hold our nerve at the end, Yasir Arafat bowled a tremendous final over, but it was a great game to play in. "I'm very happy we got over the line." on Twitter: OHHHHH LANKY LANKY! love the red rose, what a game what a day! IT'S GOING DOWN TO THE FINAL WEEK! Worcestershire are the only side to seal qualification for the quarter-finals this week and will join Birmingham Bears and Kent in the last eight. Somerset and Durham are both out while Leicestershire also can't qualify now despite not playing tonight. In a tight North Group, Northants, Lancashire and Nottinghamshire will battle it out for the final two places. Only Middlesex and Somerset cannot go through in the South Group. The final overs saw Essex make hard work of finishing off Middlesex, but they got there in the end. The damage was done for the visitors in the middle phase of the game - they didn't get enough runs in the latter stages when batting and let Essex get away quickly at the start of their reply. Tom Westley played an excellent hand for Essex in the closing stages, accumulating rather than blitzing his way to 45 from 38 balls before holing out with the scores tied. Still, he and his team-mates will be far more concerned that their quarter-final ambitions are alive and kicking. Notts make it three wins in a row with an easy victory over Durham who bow out of this year's T20 Blast. John Hastings' late 42 off 22 balls was too little too late as they could never keep up with the 10 an over required. Nottinghamshire's bid to reach the quarter-finals will go down to the final week when they travel to Leicestershire. Worcestershire breathe a huge sigh of relief as Ben Cox hits the winning run which secures their place in the T20 Blast quarter-finals. Joe Leach finished with 18 from 12 balls, a heroic effort in the circumstances, while Cox ends unbeaten on six. Saeed Ajmal was the star of the show for the Rapids though, his 2-21 helping limit Derbyshire to a total which always looked a few runs too short. It came down to Sussex needing six off the last two balls. Craig Cachopa was presented with a hit me full toss from Yasir Arafat, he could only scramble it away for a single and that left Ollie Robinson needing to find the fence to win it. He missed the last ball completely and it trickled through to the wicket-keeper to give Hampshire a nail-biting and vital win to keep up their hopes of a quarter-final place. Sussex are still well placed but haven't qualified yet. Joe Leach hammers Derbyshire seamer Nathan Rimmington for four to ease some tension for Worcs, but the visitors can't take advantage of a free hit, with just a single coming from it. Four required from the final over. Craig Cachopa and Will Beer try to scramble two runs, but Beer can't get home in time. Three singles off the first three balls as Sussex can't get Yasir Arafat away to the fence. Joe Leach and Ben Cox are dragging Worcestershire towards the quarter finals, with a steady 15-run partnership. The visitors require 16 off two overs to beat Derbyshire and seal their spot in the knockout rounds. Two huge sixes from Sussex's Craig Cachopa off Chris Wood and all of a sudden, the pendulum has swung yet again at Hove. John Hastings and Gordon Muchall are providing the few Durham fans left in the stands plenty of entertainment as they close in on a fifty partnership. Hastings has raced to 25 from 13 deliveries, but his efforts are surely in vain. Nottinghamshire are taking a big stride towards the quarter finals, while Durham's hopes will be all-but-extinguished in three overs' time. A couple of tight overs from Hampshire and all off a sudden it looks like the Sussex train is coming off the tracks. Danny Briggs and Chris Wood have squeezed the runs with some tight bowling in the closing overs. Craig Cachopa and Harry Finch at the crease for the home side. "An explosion of white as the bails come flying over the stumps. Derbyshire have this wicket, they have this danger man and the tail of Worcestershire. Whiteley goes!" It's all over at Edgbaston. Despite Oliver Hannon-Dalby's best efforts as the last-man standing, he skies a huge shot deep in to the night sky and James Faulkner clings on to claim the final catch of the night. A great comeback from Lancashire who look well short at the halfway stage. Surely a man of the match performance from captain Steven Croft with two wickets, a stunning catch and an unbeaten 65. Lancashire are still in with a good chance of qualification for the last eight. The scoring rate has slowed somewhat at Chelmsford, but with wickets and balls in hand, Essex can afford that. No sooner has that been said, then an offside boundary each for Tom Westley, who has moved to 36, and Ryan ten Doeschate, on 10, provides valuable impetus. Just 24 more needed now for Essex off six overs. They will still be in the quarter-final race next week. Chris Nash falls 12 short of what would've been a fine century. Are Hampshire still in this? Sussex need 39 off 22 balls. Birmingham lose their ninth wicket as Jeetan Patel succumbs to the fielder on the fence. But, hang on....Oliver Hannon-Dalby keeps home hopes alive with a huge six off Jordan Clark. That's about as comprehensive as it gets. Surrey emphatic winners, helped by that fantastic innings from Jason Roy that will live long in the memory. Realistically, Somerset conceded 30 runs more than they should have done with the ball, not helped by dropped catches, and once they lost two early wickets, their fate was all-but sealed. While Roy will rightly take the headlines for the hosts after his T20 career-best 122 not out, Kumar Sangakkara (31) and Rory Burns (46 not out) were valuable foils to the England one-day opener in the Surrey run feast. Durham's hopes of reaching the quarter finals are taking a battering here, as they slip towards what now looks sure to be their eighth loss in the T20 blast. Paul Collingwood fails to find the boundary even once before he's caught by Dan Christian off the bowling of Steven Mullaney for 24 from as many deliveries. 106 needed from 6 overs. Durham need a miracle. Looking like a stiff target for the Bears to win this one. Will Jeetan Patel and Oliver Hannon-Dalby be the Friday night heroes in the second city? Will Smith's bowling figures make unpleasant reading. He's been smashed for 45 runs off his four overs and has no wicket to his name. Sussex need 54 off 30 balls now to record a famous win in the south coast derby. Chris Nash is the key, he's 75 not out. "Brett D'Oliveira is out. This is what we've seen Derbyshire do after they get into a good position, are we seeing them do the same thing to this Worcestershire Rapids team?" Two wickets fall in two balls for the Birmingham Bears and it's Lancashire's game to lose now. James Faulkner has Ateeq Javid caught behind for a brisk 18 and then picks up Recordo Gordon first ball. Just two wickets remain now for the side top of the North Group. It's the last rites here at The Oval. James Hildreth did get to a well-deserved fifty but went soon after attempting the impossible of keeping Somerset in the hunt. Lewis Gregory is also doing his best under the lights, with a big six off Azhar Mahmood, but the result is not in doubt now. A good fight back from Yorkshire but ultimately in vain as Ben Duckett hits Matthew Fisher to the boundary to ensure victory. Duckett finishes unbeaten on 40 from 26 balls, with six boundaries and guided Northants through the tricky final overs well. Yorkshire's batting ultimately cost them. It was a promising performance from their young bowlers but it has rounded off another disappointing T20 seson for the White Rose. Worcestershire can't throw this game away, surely? Richard Oliver has just become Derbyshire's third scalp, while the run rate has increased to more than eight an over. Remember, a win and the Rapids are into the last eight. The required run rate creeps up above 10-an-over once again for Sussex. Australian George Bailey is at the crease for the hosts alongside Chris Nash but he can't quite get himself off and running yet as Will Smith restricts him to just singles. 75 needed off the last 7 overs for a place in the quarter-finals. Tim Ambrose shows some experience and nerve for a tense situation with two fours in an over off Arron Lilley. But, he looks to repeat the feat down the ground and gets caught on the boundary by Liam Livingstone. Lancashire picking up wickets at regular intervals here. Birmingham Bears need 26 off 13 balls. Matthew Waite hasn't done bad on debut for Yorkshire, finishing his four over spell with figures of 0-27. Northants have judged this innings well. Ben Duckett meanwhile is just beginning to free his arms as he launches Ben Coad for a huge six. Alex Wakely has fallen just shy of a half-century, but his 45 from 41 balls has set Northants up nicely. They require eight from the final 12 balls. Northants will qualify if either Nottinghamshire or Lancashire lose. It'll be a waiting game once this one is over. Jesse Ryder is making it look easy. So are Essex in their run chase. He celebrates going to his half-century by ramping Harry Podmore over short fine leg for another boundary. However, just when it seemed he might steer the hosts home he mis-times a cut off Mitchell McClenaghan and Ollie Rayner takes a simple catch at point. It all seems a little bit too late for Middlesex, who are heading for their eighth T20 defeat in nine matches. Great figures from Lancashire captain Steven Croft from his four overs. Just 16 runs taken off him and two wickets to his name in the process. Not a bad evening really when you consider he struck an unbeaten 65 earlier. Could be set for a tight finish at Edgbaston with the Bears needing 43 off the remaining 24 balls. Some of the Durham fans have seen enough and are already heading for the exits. Michael Stoneman holes out to Samit Patel at deep square leg off the bowling of Steven Mullaney, to leave the hosts three down and needing 13 an over to win. Nottinghamshire cruising to victory now at Chester-le-Street. What do they say, get one, get two? Hampshire have claimed a second wicket in as many overs to peg Sussex back. Young leg-spinner Mason Crane does for Matt Machan who departs for just a single. Sussex need a further 104 to win from 60 balls at the halfway stage of their innings. It's clearly not going to be Somerset's night, which means they are going out in the group stages. Who would have thought that they would be in this pickle when Chris Gayle was going berserk earlier in the season? They need just the 76 runs off four overs at a rate of 19 runs an over with five wickets in hand. A simple equation, then. My word did Hampshire need that wicket. Luke Wright and Chris Nash were carving the visitors apart at Hove until Yasir Arafat splits the opening partnership by bowling skipper Wright just two runs shy of their 100 partnership. It's surely just a matter of time before Worcestershire confirm their spot in the last eight. Richard Oliver is leading the way with 33 from 27 deliveries, as the Rapids inch their way to victory at Derby. 95 needed from 72 balls. A spectacular catch at Edgbaston from Lancashire captain Steven Croft at point off the bowling of James Faulkner. Diving full-stretch one-handed, he clings on to a full blooded cut shot from Laurie Evans and could that be a match-winning moment for the Lightning? They've picked up two quick wickets in as many overs after Rikki Clarke fell for just 9 to Stephen Parry the over before. Jesse Ryder is still going well for the home side, helped considerably by George Scott spilling the simplest of chances at square leg with the New Zealander on 36. Middlesex could well regret that error, particularly as Tom Westley has joined Ryder and quickly advanced to 14 off 10 balls in helping Essex keep the run rate above 10 runs an over during the powerplay. Halfway mark at Wantage Road and Northants just have their noses in front. A good 56-run partnership between Alex Wakely and David Willey has just ended as Willey holes out to long-on off Matthew Fisher. It's been a good bowling effort from the young Tykes, particularly from Fisher who came back well from being hit for six to dismiss Willey, but the home side's target is a run-a-ball from here. A huge innings from Chris Nash for Sussex as he continues to tuck in to the Hampshire bowling at Hove. The required rate dips below 10-an-over for the first time in this run chase and James Vince's men need a wicket. Having made a blistering start, Phil Mustard throws his wicket away as he attempts to launch Dan Christian into the stands and is instead caught by Steven Mullaney in the deep. Graham Clark is out for a duck the next over, as Notts seamer Jake Ball rips the youngster's stumps out of the ground. Paul Collingwood is next man up for Durham, who now need 158 from 15 overs. The winner of this one will have one foot in the last eight. A promising partnership has been broken at The Oval thanks to an unbelievable catch from Zafar Ansari, getting rid of Tom Cooper for 29. The Surrey man has taken a quarter-chance one-handed at full stretch on the run just an inch off the turf to stun Cooper, who had put on 57 with James Hildreth. It will need plenty more blows like the six from Luke Ronchi soon after his arrival at the crease for the visitors to have any hope. "Derbyshire have got all their bowling options tonight and with a heavy four day match starting tomorrow, maybe not a bad idea to get Billy Godleman off. "I did see him pull up on a hamstring so there may be an issue." Any nerves Worcestershire supporters had at the start of this chase will have been settled by the visitors' steady start. Captain Daryl Mitchell has just fallen for 13. But the visitors need 113 from 15 overs. Should be a walk in the park. Sussex are romping along at Hove as they bid to chase 205 to beat Hampshire. Chris Nash and Luke Wright have both got off to fliers and have struck nine boundaries between them. A win for Sussex and they're in the quarter-finals. Still a big ask from here though. Welcome to Chelmsford, Mitchell. New Zealander seamer Mitchell McClenaghan drops his first ball short and Mark Pettini is waiting on the back foot to slap it over mid-wicket for six. Jesse Ryder also gets in on the act against his fellow countryman, with a boundary to third man, a big six over square leg off the front foot and a drive through the covers for four more. That's 21 off the over and together with three boundaries coming from Gurjit Sandu's opening over, represents an absolutely flying start for Essex. Brendon McCullum strikes two successive sixes off Stephen Parry, the first almost in to the top-tier of the huge pavilion. He rockets onto 41 not out off just 24 balls but loses partner Tom Lewis for a breezy 22 as Ashwell Prince holds a catch in the deep off Steven Croft. The very next ball, McCullum's exhibition is over as he knicks off through to Alex Davies. Could the Lightning pull off an upset now? This has been a decent fight from a young Yorkshire bowling attack. Will Rhodes has been especially accurate, his two overs costing just nine runs as Northants struggle to find the boundary. Glenn Maxwell has just been brought into the attack and although Alex Wakely smashes his second ball for four, the rest of the over costs just six runs. Birmingham Bears number three Tom Lewis is clearly picking up some inspiration from his current batting partner Brendon McCullum. The left-hander smashes a sweep shot off Arron Lilley all the way over the fence to keep the hosts on track. Chris Nash isn't hanging around as Sussex start a mammoth chase of 205 at Hove against Hampshire. He's tucked into Will Smith's opening over with two fours and a six to get the Sharks off and running. At the end of the powerplay, Somerset 's chase is well behind the 57-0 Surrey had recorded at the same stage. Duckworth-Lewis says the par score for a successful chase at this point is 71-0. Peter Trego is the latest man to go for 26 from 16 balls, caught by Kumar Sangakkara off the bowling of left-armer Sam Curran, while Jim Allenby was a victim of former England man Jade Dernbach. "Two years ago Michael Lumb was on 96 in Chester-le-Street and set to become the first Notts player to score a T20 100. It was a faultless innings and then suddenly he was stumped. "Tonight Rikki Wessels was nailed on to become that first centurion. I would have put my house on it. But on 97 he tried to paddle a ball from Usman Arshad and scooped it into the hands of the keeper. You had to feel for him. "Either way it looks like Notts have kept their campaign alive though because I can't see Durham chasing down 199 to win. I would put my house on that!" Birmingham Bears have lost a wicket in the opening five overs of their pursuit of 146, but they've still got Brendon McCullum at the crease. He may be a magician with a bat, but it looks like he's got himself in a spot of bother trying to play a ramp shot over his head off James Faulkner. It's fair to say he missed making contact with the bat and the ball hit him in a sensitive area! Middlesex will be disappointed with that, despite Neil Dexter guiding Graham Napier's final ball for a boundary in the third man area to finish on 18 not out. The feeling is that their total is a little below par, with the innings stagnating after an early flurry of boundaries. The visitors' case was not helped by the dismissal of Eoin Morgan for 29 in the penultimate over. The England one-day captain tried to swot away a ball from Shaun Tait angled down the legside but only found the gloves of wicket-keeper James Foster. A very good first over from Liam Plunkett is followed up by a second, not-so-good one. It flies away for 25 runs as Yorkshire struggle to get some control over Northants. Richard Levi, another international player who has had a quiet season, struck Plunkett for three boundaries and a huge six to get Northants' chase up and running. Plunkett has had the last laugh however as he runs Levi out for 30 from 14 balls, before Josh Cobb is dismissed for a golden duck. Good fight back from Yorkshire. Nottinghamshire set 199 Durham to win in this huge North Group fixture, with Australia all-rounder Dan Christian making a potentially vital 14 from six deliveries. Riki Wessels was the star of the innings though, his 97 the highest ever score by a Notts batsman in domestic T20 cricket. Hampshire have set Sussex a huge target at Hove. They've gone past 200 as captain James Vince finishes unbeaten on 90. That's the third time he's carried his bat through an innings in the competition - and that's just this season! Worcestershire will be chasing 150 for a place in the quarter-finals. Derbyshire launched a slight recovery from 69-4, but no batsman could make a sizeable score once they got going. Where's your money for this one? Michael Hogan bowls the final over and Calum Haggett somehow manages to squeeze the ball to the boundary, before getting Stevens back on strike. Darren Stevens slams a huge six into the temporary stand - that flew miles - but he falls the very next ball as he tries to win it with a six and scoops it to Chris Cooke. Kent needed three runs from the last ball to win but Haggett was run out coming back for the second to give Glamorgan a win by one run. That's a remarkable victory for Glamorgan, who needed that to boost their quarter-final chances. Some superb death bowling from Michael Hogan and Graham Wagg. Brendon McCullum looked like he was giving himself a few sighters against Lancashire, but have no fear, he's back to his usual self. The New Zealand captain cracks four, four, six, a dot ball and then another six off consecutive balls from Jordan Clark. All of a sudden, he's raced to 22 not out off 11 balls. Riki Wessels misses out on a maiden century in T20 cricket, as he loops an easy catch to Durham wicketkeeper Phil Mustard off the bowling of Usman Arshad. Arshad picks up another crucial wicket with the very next ball, as James Taylor is caught at deep square leg for 37 from 22 deliveries. Just when you thought it couldn't get any worse for Somerset. Johann Myburgh is run out second ball. Peter Trego has come in swinging and hit three boundaries already, but it's a big uphill struggle from here. Graham Wagg has continued his good game to turn the screw on Kent in the final overs. The spinner has kept Fabian Cowdrey and Darren Stevens relatively quiet, but Stevens is an experienced campaigner. He's currently on 20 from 15 balls, with three boundaries. Cowdrey found it tougher going before he was eventually trapped lbw by Michael Hogan for 1, while Alex Blake could only make a two ball duck. Kent need 22 runs from the final 12 balls. Birmingham Bears have started their pursuit of 146 to beat Lancashire at Edgbaston. Opening up - guess who? Yep, big-hitting Brendon McCullum with captain Varun Chopra for company. With Shaun Tait's yorker doing for youngster Ryan Higgins, Essex are turning the screw at Chelmsford. Middlesex are struggling to find the boundaries and Eoin Morgan being kept off strike. The England one-day captain has, however, managed to punch Ravi Bopara's final ball of the over away to the extra cover boundary, bringing some relief for the visiting supporters and taking him onto 22. Hampshire captain James Vince could carry his bat here at Hove. Just three overs to go in the visitors' innings and he's on to 73 not out. He's yet to clear the fence with a six though. WESSELS ON COURSE FOR TON? Nottinghamshire are going to set Durham a huge target if the visitors can't find a way to remove Riki Wessels, who's just bludgeoned his fourth six of the innings straight down the ground. Wessels has 82 runs from 42 deliveries, while James Taylor has moved into the twenties, with only one boundary so far. Matthew Waite finishes with an unbeaten 14 on his T20 debut as he slashes the last ball of Yorkshire's innings to the boundary. That's a better score for Yorkshire than it looked like they'd manage at the halfway stage, but Northants must be the favourites. For the home side, David Willey was the stand-out bowler, finishing with figures of 4-1-24-1. Jason Roy, take a bow. He bats through the innings and finishes unbeaten on 122, having powered eight fours and six sixes in his mesmeric 65-ball knock. The last two of those maximums came in the last over, lifting Alfonso Thomas over the longest boundary to bring up the Surrey 200 and then thundering a last-ball full toss over the ropes as well. No wonder he's received a standing ovation, and even a hug off Jamie Overton, the man who dropped him on 18. He and Rory Burns (46 from 33 balls, three fours, one six) added an unbroken 124 in the last 11 overs. Some going. "I think Derbyshire could do with a finisher to help them secure a run chase which has been one of their issues this year." Worcestershire are firmly on course to beat Derbyshire and reach the quarter-finals tonight, as two more Falcons wickets fall at the County Ground. Billy Godleman picks out Ed Barnard at backward point off the bowling of skipper Daryl Mitchell, before Wayne Madsen becomes Rapids spinner Saeed Ajmal's latest victim. A much-needed wicket for Sussex at Hove as Adam Wheater departs shortly after making a half-century off 26 balls. The diminutive wicket-keeper struck four fours and three sixes in his entertaining knock. A fantastic half-century from Lancashire captain Steven Croft who has masterminded an almost one-man comeback for the Lightning at Edgbaston. He loses his partner James Faulkner shortly after though as the Australia all-rounder departs for a quickfire 20. But, the Blackpool man battles on and finds the boundary with two more fours to finish unbeaten on 64 as Lancashire finish their effort on a respectable 145-6. Joe Denly's impressive innings has come to an end, but not before he put Kent on course for yet another victory. Denly made 70 from 36 balls, a season's best for him, with nine boundaries and two sixes before he was caught by Michael Hogan. Kent are still the favourites, despite Sam Billings falling for just eight. Sam Northeast is just starting to kick into gear - he's on 33 from 26 balls. Nottinghamshire's Riki Wessels brings up his third half century of this season's T20 Blast with a towering six off the bowling of Chris Rushworth. Notts will want 180 from here you feel. Eddie the Eagle, the Essex mascot, does a jig of delight as Nick Gubbins holes out at long off trying to smash spinner Tom Westley into the stands to go to his fifty. That's an important blow for the hosts, with two relatively new batsmen now at the crease. CAN MORGAN FIND SOME FORM? Eoin Morgan strides to the wicket for Middlesex after John Simpson goes for 29, bowled by Graham Napier. The England one-day captain is quickly up and running, nurdling a couple of twos into the legside and a single to round off the over. Is this Morgan's night? He's certainly in need of some runs. Liam Plunkett is doing his best to get Yorkshire into this game, striking David Willey for a huge six, before play is temporarily held up by a pitch invader. Once the invader has been cleared off, Willey finishes to end with fine figures of 1-24 from his four overs. To add to Yorkshire's woes Plunkett has fallen in the very next over, bowled by Azharullah for 23. Hampshire captain James Vince has notched up his fourth 50 of the T20 Blast campaign as his side continue to build a strong platform at Hove. Wicketkeeper Adam Wheater's giving him great support in his new role at number three in the batting order and has two maximums to his name so far tonight. Saeed Ajmal forces a hasty rewrite as he removes Wes Durston for a battling 32 from 29 balls. I had been about to tell you how Durston and Billy Godleman had set Derbyshire back on track against Worcestershire, but that dismissal leaves the hosts in a heap of trouble once again. Remember a Worcestershire win seals a quarter-final place. Scott Borthwick has his second catch of the night and a dangerous Nottinghamshire partnership comes to an end. Michael Lumb is the man to go, slicing an expansive stroke off the bowling of Paul Collingwood to Borthwick at deep cover. Notts are 81-2 at the halfway point of their innings. That's a superb century from Jason Roy - and at a rapid rate too. Fittingly, he gets there with a six, hitting Jamie Overton straight down the ground. He stands with his arms raised then bows. He was the only Surrey player to have ever got a T20 hundred, and now he has another one. Despite losing partner Daniel Bell-Drummond, Joe Denly has carried on carting the Glamorgan bowlers around the park. Craig Meschede is the latest bowler to suffer at Denly's hands as he's struck for a huge six as Kent take 15 from his over. Sam Northeast can barely get hold of the strike but his quick running has kept the score ticking over. JASON ROY IS SMASHING IT! Brute force from Rory Burns sees him clear the straight boundary from a free-hit offered by Jim Allenby. He's then dropped by Jamie Overton, who is given some stick by the home crowd after spilling an earlier chance. Just to compound Somerset's misery, Jason Roy lofts a superbly-timed straight hit back off Max Waller that goes well back into the OCS Stand. Surrey have moved past 150, the rate is up above 10 runs an over and Surrey could be on course for a score in excess of 200. Roy, meanwhile, will be eyeing three figures. He's 89 not out. Glenn Maxwell's miserable campaign continues as he is caught by David Willey off Steven Crook. The over before Alex Lees went for 46 - his highest T20 score for Yorkshire this season - after he was caught and bowled by Graeme White. It wasn't the quickest innings, taking 42 balls with two boundaries and one six, but considering Yorkshire were two wickets down inside the first three overs, it was what the side needed. Yorkshire will do well to reach 140 from here. Lancashire have been pegged back again by Birmingham. Jeetan Patel's grabbed his second wicket of the evening and has gone for just seven runs off three overs. Luke Procter's the latest man to succumb for the visitors after a fifth-wicket partnership of 41 with Steven Croft as they continue to struggle against the North Group leaders. Nottinghamshire have recovered well from the loss of Alex Hales at Durham, with Michael Lumb leading the way on 26. Riki Wessels has also shown plenty of attacking intent as the Outlaws have raced to 54-1 at the end of their first six overs. Big big game at Chester-le-Street tonight. Sussex have made a breakthrough after a strong start from Hampshire at Hove. Michael Carberry drives a touch too early at a ball from Chris Liddle and Ollie Robinson dives forward to take a smart catch at mid-on. "It's not been Derbyshire's best start in the competition. They've averaged 51 in the powerplay this season but they'll be hard pressed to find that here." Derbyshire have their work cut out to save this game, as Worcestershire have taken a third wicket at the County Ground. Shiv Thakor is the latest man to fall, caught by Brett D'Oliveira from the bowling of 19-year-old seamer Ed Barnard. The Falcons are 27-3 at the end of the powerplay. Former captain and newly-appointed Essex cricket committee chairman Ronnie Irani would have been happy with the Eagles' start, but not the way that Middlesex have now started to fight back. Graham Napier's over has disappeared for 16, including a sweet strike down the ground from Nick Gubbins for a maximum, moving him to 26 from 16 balls. John Simpson has 17 from 11 at the other end. 10 overs have been bowled in Lancashire's innings at Edgbaston and they're in need of some urgent impetus. Luke Proctor and captain Steven Croft are trying to rebuild the damage from 34-4 amid some tidy bowling from the hosts. Durham's tidy start is rewarded when Nottinghamshire's Alex Hales attempts to hammer John Hastings over the leg side boundary, but instead picks out Scott Borthwick in the deep. The hosts have taken a mere 13 runs from their first three overs. Jason Roy has displayed the kind of form that earned him an England call after that early let off, going to his half-century with an easy two off Jim Allenby. He then scoops the seamer for another three runs to keep the Surrey momentum going as they reach the halfway stage of their innings. Ah. Just as Yorkshire were mounting a tiny recovery, with Jonny Bairstow smashing Graeme White for six, the stand-in captain has fallen. He's tries to launch Josh Cobb's spin for six but instead lofts a catch to Ben Duckett at deep mid-wicket. He's replaced by Glenn Maxwell, another international star who has had a quiet season with the bat. Wow, the T20 stars are falling like flies at the moment! Somerset look relieved to have finally ended a Surrey opening stand of 84 that had been threatening to take the game away from them, even at this early stage in the game. It was a leg break from Max Waller that did the trick, turning between bat and pad of the left-handed Kumar Sangakkara, allowing New Zealander Luke Ronchi to complete a simple stumping. Joe Denly and Daniel Bell-Drummond aren't hanging around down in Tunbridge Wells. Michael Hogan's first two overs have cost 26, with Denly smashing five boundaries and one six off the right armer's bowling. Dean Cosker has fared slightly better, with his first over costing 11 runs. Kent are looking to get this over as quickly as possible. Sam Jackson on Twitter: Hoping @CricketingBears can stay top tonight, beautiful evening for cricket. Come on you bears!! The nightmare start continues for Lancashire at Edgbaston. Birmingham Bears have claimed four wickets now as Karl Brown is the latest man to depart trapped lbw by spinner Jeetan Patel. Think they might need a few more runs on the board to keep Brendon McCullum quiet. Worcestershire are off to the perfect start at Derbyshire, as Joe Leach finds the edge of Hamish Rutherford with his second delivery. Tom Kohler-Cadmore makes no mistake in the slips, and Rutherford has a long walk back to the pavilion. Leach's dream over continues as he bowls Chesney Hughes with the final ball. Steady start at Hove from the visitors Hampshire as James Vince tucks in to Michael Yardy's opening over with a couple of fours. What a start for Essex as Reece Topley gets one to leave Dawid Malan and his attempted drive is easily taken by wicket-keeper James Foster. Essex are desperate for a win to keep their quarter-final hopes alive. Karl Brown's hoping to get Lancashire's innings off the ground and he's straight in to his work with a big hit off Oliver Hannon-Dalby for six. But, moments earlier the visitors lost another wicket. Liam Livingstone couldn't clear the fence for a second time and Jeetan Patel was there to snaffle the Lancashire opener off Hannon-Dalby's bowling. Now Jason Roy and Kumar Sangakkara are really starting to opening up, much to the delight of the home fans. The Surrey fifty comes up in the sixth over as Sangakkara pulls Alfonso Thomas to the mid-wicket fence before Roy chips down the ground for another boundary off the same bowler. The hosts can be mightily pleased with their progress at the end of the power play. Durham have won the toss and will bowl first at Trent Bridge. Nottinghamshire name the same side which eked out a narrow victory over Derbyshire in their last T20 Blast appearance, with Alex Hales set to face the first ball in just a few minutes' time. Durham, who have lost five of their previous six games in this competition, are unchanged from the side which suffered defeat at Yorkshire last time out. Nottinghamshire: Hales, Lumb, Wessels, Patel, Taylor (capt), Christian, Mullaney, Read, Wood, Ball, Gurney. Durham: Stoneman (capt), Mustard, Clark, Collingwood, Muchall, Arshad, Pringle, Hastings, Richardson, Borthwick, Rushworth. Yorkshire's captain for the night Jonny Bairstow has just arrived at the crease after Jack Leaning was run out without scoring. There is little riding on this game for the visitors, but Bairstow may want to make another statement to the England selectors. Their batting hasn't exactly fired at Lord's has it?! Aggers and Geoffrey Boycott are just wrapping up on Test Match Special after an eventful day at Lord's. BBC Radio 5 live Sports Extra from Hove will be Charles Dagnall and co with full ball-by-ball commentary of the crucial clash in the South Group between Sussex and Hampshire. Derbyshire have won the toss and will bat first at the County Ground. The hosts are unchanged from the side which all-but-ended Yorkshire's hopes of qualifying for the quarter finals on Sunday, as they seek to lift themselves off the foot of the North Group table. Visitors Worcestershire also name the same starting line-up which lifted them to within a single victory of reaching the last eight at Headingley on Tuesday. Derbyshire: Rutherford, Durston (capt), C Hughes, Madsen, Godleman, Thakor, A Hughes, Knight, Poynton, Cork, Rimmington. Another fine batting performance from Graham Wagg has helped boost Glamorgan in the final overs of the game. His unbeaten 54 from just 24 balls included five sixes, as he helped Glamorgan salvage a decent score after a tricky middle period. Matt Hunn starred for Kent with the ball - he's finished with figures of 3-33, a fine return on his T20 debut. Well over 20,000 are expected at The Oval tonight, but they have only seen a glimpse of the expected fireworks from the mouth-watering opening partnership of Jason Roy and Kumar Sangakkara. In fact, England one-day batsman Roy has been dropped on 18 by Jamie Overton off Tim Groenewald. It was a difficult chance on the run, but the Somerset paceman will still be disappointed not to have hung on. Meanwhile, Sri Lanka left-hander Sangakkara has moved serenely onto 15 not out after his superb 110 against Kent in the County Championship in midweek. It's the first six of the night down at Edgbaston as Lancashire's Liam Livingstone has the officials searching for a new ball. He's deposited Recordo Gordon out of the ground. But the medium pacer gets a breakthrough a couple of balls later as Ashwell Prince fails to time one and Birmingham captain Varun Chopra takes the catch in the deep. With the sell-out crowd at Chelmsford building nicely, Middlesex have won the toss and chosen to bat. Essex are unchanged and include Australian Shaun Tait, who is the joint-second leading wicket-taker in T20 Blast before this round of matches with 20. England's Steve Finn is absent for Middlesex after sustaining a minor finger injury, while Paul Stirling and Andy Balbirnie are on international duty, meaning Ryan Higgins, Harry Podmore, Gurjit Sandhu and Neil Dexter all come in. Essex: Pettini, Ryder, Westley, Bopara, ten Doeschate (capt), Dawson, Foster, Napier, Topley, Masters, Tait. Middlesex: Malan, Gubbins, Simpson, Morgan (capt), Higgins, Dexter, Scott, Rayner, McClenaghan, Podmore, Sandhu. Sussex have won the toss and elected to bowl at Hove. The second-placed Sharks are almost through to the quarter-finals with 15 points from their 12 matches, Hampshire are one of four teams locked on 12 points and are looking to reach their seventh consecutive quarter-final. Teenage leg spinner Mason Crane comes in to the Hampshire side for just his second senior appearance. Sussex: Wright (capt), Nash, Cachopa, Machan, Bailey, Finch, Beer, Yardy, Robinson, Mills, Liddle. Hampshire: Carberry, Vince (capt), Wheater, Shah, Gatting, Smith, Wood, Arafat, Briggs, Bird, Crane. Things go from bad to worse for Yorkshire in this T20 Blast competition. David Willey, on his return from injury, beats Will Rhodes all ends up in his first two deliveries before the batsman slaps his third to Ben Duckett. He departs for a duck and is replaced by Jack Leaning. It's a fine over from Willey, full of pace and accuracy, and it's yet another poor start for Yorkshire. A tight spell from James Tredwell, who finishes with figures of 4-0-21-1, has put Kent right back in this game. Matt Hunn has had a decent debut so far, bowling tightly and having Mark Wallace clean bowled for just three. His final over is less accurate however, as Chris Cooke smashes two full tosses for huge sixes. The second goes sailing over the sightscreens and trees to register another huge six. Hunn has the last laugh however as Cooke attempts a third six and is caught in the deep for 36. He's been replaced by David Lloyd. It's Surrey who will bat first at The Oval after winning the toss. These two sides might be struggling, but at least there's no chance of the complete washout when the sides were scheduled to meet at the County Ground in June. Jade Dernbach returns for Surrey in place of James Burke as the hosts look to bounce back from defeat by Hampshire last time out. Somerset have lost their last three, including a 22-run defeat at Canterbury against Kent last Friday, and also make one change, with Lewis Gregory in for Abdur Rehman. Surrey: Roy, T Curran, Sangakkara, Foakes, Solanki, Mahmood, Burns, Ansari, Batty (capt), S Curran, Dernbach. Somerset: Myburgh, Allenby, Trego, Hildreth, Cooper, Ronchi, Gregory, Groenewald, Overton, Thomas (capt), Waller. Lancashire's Paul Horton's not involved in the action tonight, but is still clearly in awe of Birmingham Bears' Brendon McCullum. Speaking to BBC Radio Lancashire before the game, he said: "He is up there for power and aggression in Twenty20 cricket alongside Chris Gayle and AB De Villiers. "But in the end he's just another guy to get out and we'll have our plans for how to do that going in to the game." Down at Wantage Road, Northamptonshire have won the toss and will bowl first against Yorkshire. Yorkshire, who are all but mathematically out of the running, have opted for a young side, with Andrew Gale and Tim Bresnan rested. Jonny Bairstow has taken over the captain's role, with Matt Waite and Ben Coad handed their T20 debuts. Two wins will guarantee Northants a quarter-final place, with David Willey returning to the Steelbacks side. It's the second edition of what's been labelled #elclasicoast from Hove this evening and both sides will have more than local bragging rights at stake. by seven wickets thanks to an unbeaten fourth-wicket partnership of 144 between Craig Cachopa and Matt Machan. But, Hampshire know they've won seven out of the last eight completed matches between the two sides at Hove. The Sharks sit second in the south group with one hand on a quarter-final spot while Hampshire, led by captain James Vince find themselves one of four sides locked on 12 points. Glamorgan are ticking along nicely at eight runs an over as they approach the half-way stage. But James Tredwell has snared a wicket with Ben Wright sending a full-toss straight down Matt Hunn's throat. The dangerous Craig Meschede has also fallen, well held by Mitchell Claydon to leave Glamorgan struggling slightly after that strong start. Birmingham Bears have won the toss at Edgbaston and will bowl first. Lancashire need a win to keep up their hopes of holding on to fourth place in the North Group while the Bears have no such worries, having already booked their place in the quarter-finals. Big-hitting Brendon McCullum once again features for the hosts while Lancashire will look to a big performance from their overseas man James Faulkner. Birmingham: Chopra (capt), McCullum, Lewis, Clarke, Evans, Javid, Ambrose, Patel, Gordon, Poysden, Hannon-Dalby. Lancashire: Prince, Livingstone, Brown, Croft (capt), Faulkner, Davies, Clark, Procter, Lilley, Parry, Jarvis. Sam Northeast has turned to debutant Matt Hunn, bowling from the Railway End, to break this Glamorgan partnership. Hunn, who dismissed five of the Australian line-up in their recent warm-up match, adds to his impressive tally as he bowls Jacques Rudolph for 37. The Glamorgan captain attempted to work away full toss but mis-cued and could only drag it onto his stumps. He's replaced by Chris Cooke. BBC Radio Kent's Ben Watts: An important wicket for Kent as Jacques Rudolph was looking well in touch, it wasn't the best ball he'd bowled searching for that yorker length but the South African goes. Just one run separated these two sides when they last met at Old Trafford in June. The Bears held their nerve to grab the win that night despite the efforts of James Faulkner, but this evening Lancashire Lightning know any slip up could let their north group rivals into the coveted fourth place they currently occupy. Nottinghamshire got the better of Ashley Giles' side on Wednesday and the Outlaws are level on points but with an inferior net run rate. Calum Haggett strays a little too straight and he's dispatched over mid-wicket by Jacques Rudolph for the first six of the night. Rudolph then reverse-sweeps the bowler to the leg side boundary to keep things ticking over. The Glamorgan captain has raced to 32 not out. Darren Stevens' third over is less on the mark and Jacques Rudolph clips the ball away for back-to-back boundaries and then adds a third in a row to take 12 from the over. Matt Hunn, making his T20 debut, replaces Mitch Claydon for the fourth over. An excellent diving stop from Fabian Cowdrey saves a certain boundary but he can't keep Ben Wright and Rudolph from scoring 10 from the over. Colin Ingram, Glamorgan's South African overseas player, clips Mitchell Claydon to the leg-side boundary to get off the mark. However the next ball is fuller and Ingram edges it to Kent skipper Sam Northeast, who takes a fine diving catch. That's another wicket for Claydon, who is his side's leading wicket taker in T20s this season. There are 5,000 people packed into The Nevill Ground tonight, watching under glorious sunshine as Darren Stevens opens to Jacques Rudolph. It's a decent first over from the veteran bowler but the final ball is short, wide and pulled with ease for four. We may only have one match at 17:30 BST to bring you but it's sure to be a cracker between two in form teams. Kent's Darren Stevens, who took his 300th first-class wicket earlier in the week, to open the bowling at Tunbridge Wells. Nottinghamshire went into this season's competition as one of the favourites to lift the trophy but things haven't quite gone to plan so far. With a batting line up containing Alex Hales, Riki Wessels, Michael Lumb, James Taylor, Samit Patel and Dan Christian it's easy to see why they were among the front-runners. Notts can still qualify, but they may have to win their remaining two games, starting at Durham tonight. The visitors will need to win their next two games if they have any hope of making the quarter-finals. Captain Jacques Rudolph has had a quiet T20 season by his standards, but he'll be hoping to change that tonight. Kent, who have already qualified for the quarter-finals, have omitted Matt Coles but are otherwise unchanged from the side that beat Gloucestershire last week. Kent: Bell-Drummond, Denly, Northeast (capt), Billings, Cowdrey, Stevens, Blake, Haggett, Tredwell, Claydon, Hunn. Glamorgan: Rudolph (capt), Ingram, Wright, Cooke, Wallace, Meschede, Wagg, Lloyd, Salter, Cosker, Hogan. There's plenty at stake tonight with several sides in with a chance of qualifying or putting one foot in the quarter-finals. We know Kent and Birmingham Bears are already there. But who else do you think will make the last eight? Let us know by getting in touch using #bbccricket on Twitter. I think it's probably better if you stay with us for the next few hours because it's not particularly pretty viewing at Lord's if you're an England fan. Australia finally declared on 566-8 after Steve Smith had made 215 - the first double hundred of his career. Things weren't quite so easy when England came out to bat, especially for Adam Lyth who was out for a second ball duck. They've now slipped to 40-4. Worcestershire Rapids director of cricket Steve Rhodes says his side will learn from last season and not allow their motivation to slip as they close in on a T20 Blast quarter-final place. Worcestershire also had to win their last match - also against Derbyshire - in 2014 to make it through to the knock-out stage which they did, but were then beaten comfortably by Surrey at The Oval in the quarter-finals. As always, we've got every match covered in full by BBC local radio this evening. Leaders Kent are already in the quarter-finals and have sealed a home tie. Sussex are the only team who can guarantee qualification if they beat Hampshire at Hove. Gloucestershire, Essex and Glamorgan, who all have 12 points, will still have a chance of going through in the final week, no matter how they get on tonight. Surrey and Somerset have a game in hand on the rest of the teams above them, but will probably need to win their final three games to stand a chance. here to see the North and South Group tables. Okay folks it's time to get your calculators out because this could get complicated. I'll try and keep it as simple as possible though! As I've already mentioned Birmingham Bears have qualified. Worcestershire will go through to the last eight if they win at bottom side Derbyshire. Northants can also seal a quarter-final spot with victory over Yorkshire if either Lancashire or Nottinghamshire fail to win. Notts travel to Durham and Lancashire play Birmingham Bears at Edgbaston, but neither can qualify tonight. Durham will be out if they lose and Lancashire win, while Leicestershire, who do not play this week, need a lot of results to go their way to be in with a chance of qualifying next Friday. We've had nine weeks of fast and furious T20 Blast action but tonight we are down to the business end. As we reach the penultimate week in this year's group stages, only reigning champions Birmingham Bears and Kent have qualified for the quarter-finals so far. There are six spots still up for grabs, some of which could be decided this evening.